Welcome to the Bloomhouse, a place where art and architecture collide. Nestled on 2 1/2 acres of land in the hills of Texas, this home is only about 10 minutes from downtown Austin – but feels a world (or a universe) away. 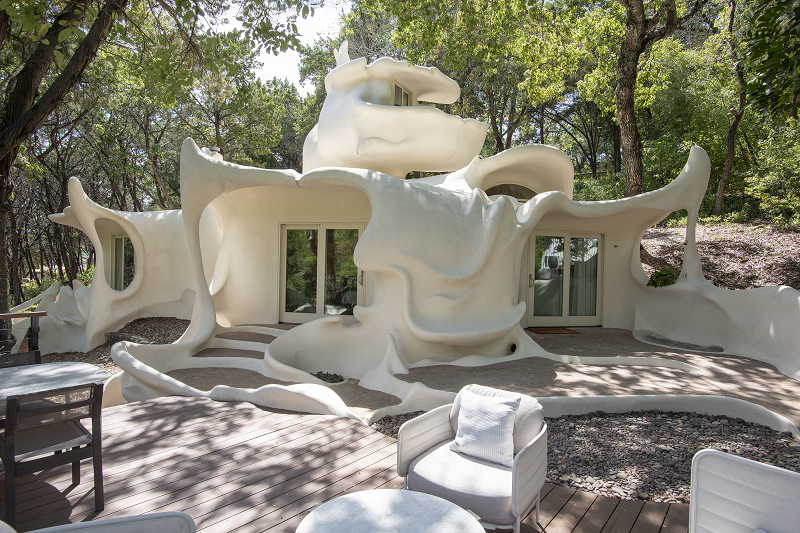 The Bloomhouse’s story began in the 1970s, when University of Texas architecture students Dalton Bloom and Charles Harker obtained a sprawling piece of land and set out to build a home that strayed from conventional design. This sparked an 11-year artistic endeavor (complete with hippie communes and Mongolian yurts) that resulted in one remaining masterpiece: the Bloomhouse. 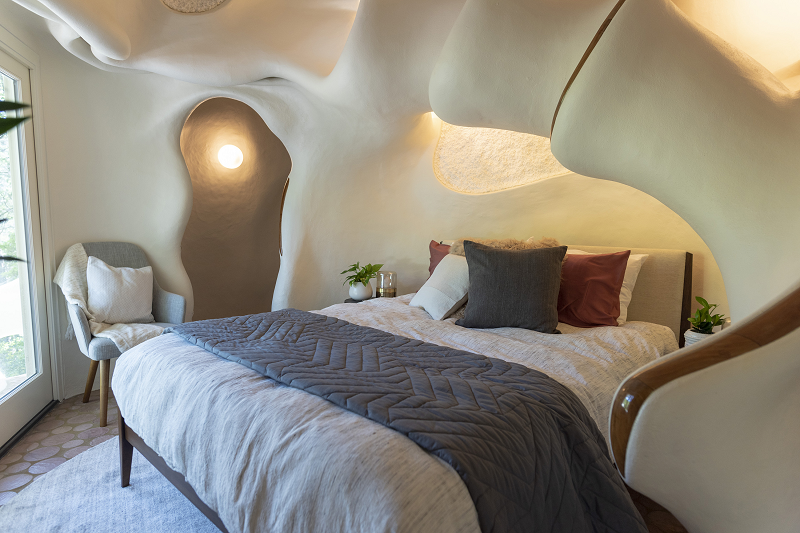 So, how exactly did this unique blend of organic form and texture become a home? First, builders used rebar to erect a cage on a concrete-slab foundation. Then they welded the cage’s steel bars, added plastic sheets, and covered it in two-part polyurethane foam to create a giant shell. Finally, they blanketed it with a layer of concrete stucco, inside and out. It took 11 years to complete the Bloomhouse, and for good reason – every square inch required incredible attention to detail. You won’t find a single straight line in the whole home. 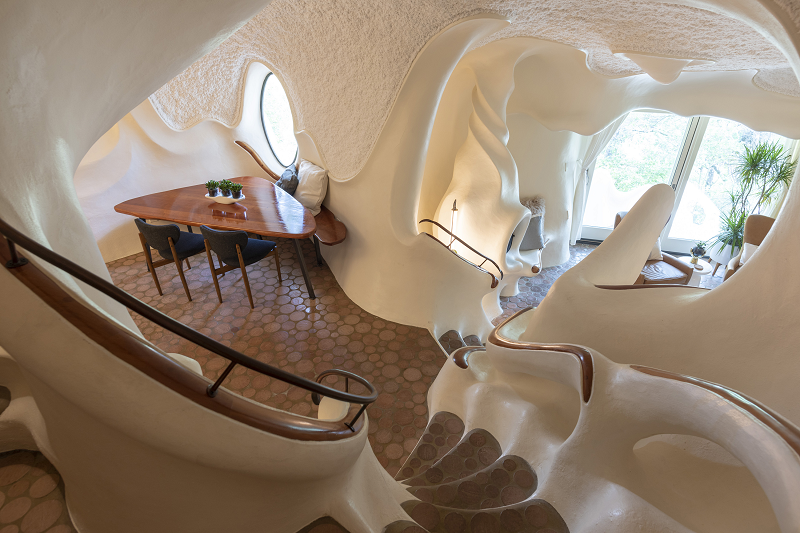 In fact, Harker actually used a pruning saw to handcarve the shape of the home into a free-flowing curve. 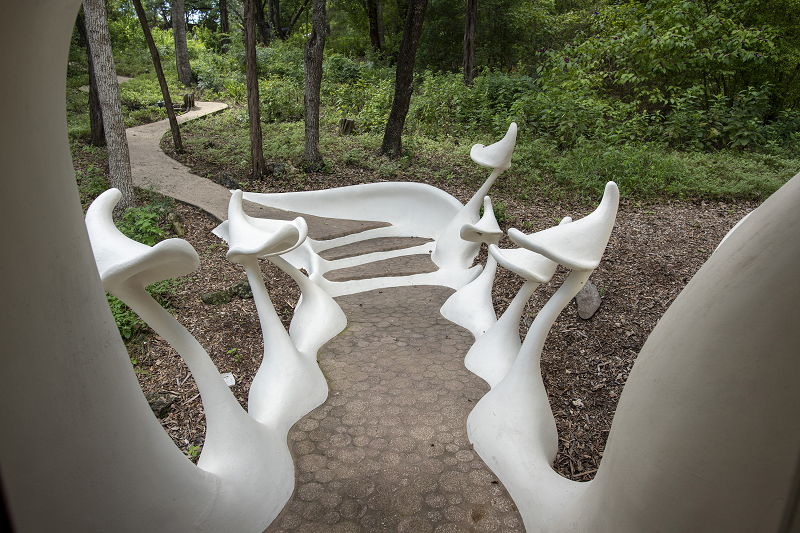 Since he designed the Bloomhouse as a place for people to come together, Harker also sculpted plenty of seating areas to encourage conversation around every bend. Over the years, the Bloomhouse has experienced its share of both owners and time in the limelight. 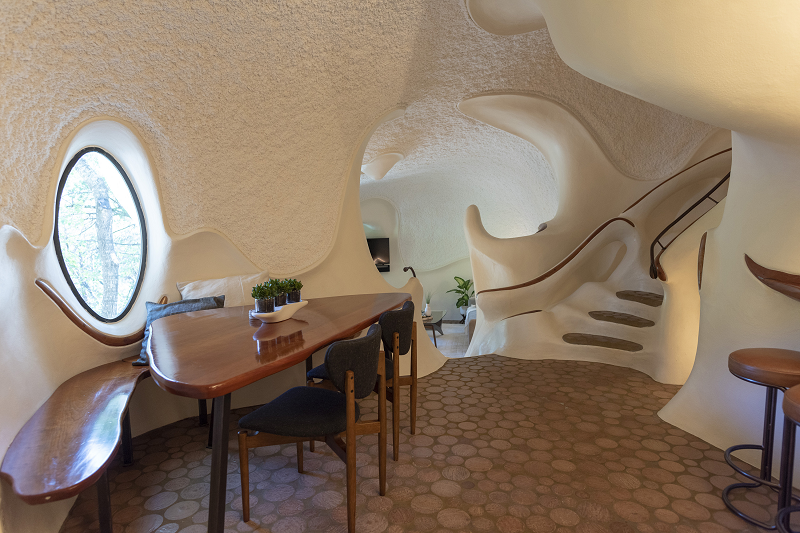 Recently, the Weird Homes Tour featured the Bloomhouse’s weird and wonderful design – Dave Neff, the company’s CEO, is a huge fan of the home’s story. “[I] love that … the right owner came along to bring a work of art back from the brink,” Neff says. That “right owner” has a name, and it’s Dave Claunch. About a year and a half ago, Claunch purchased the Bloomhouse. Because the home sits on a lucrative 2 1/2 acres of land, Claunch was worried that someone would buy the property, tear it down and build something new instead. Claunch has spent the past year and a half renovating the Bloomhouse. Since the space is so unusual, he’s served as his own general contractor. From structural updates (like replacing the plumbing and moving the mechanical systems) to cosmetic updates (like installing LED lights and a wireless sound system throughout the home), it’s been a lengthy process with an admirable long-term goal: to maintain the home for another 40-50 years. Recently at a party, Claunch pulled up pictures of his newly renovated Bloomhouse. And in a twist of fate as unusual as the home’s structure itself, another guest had some surprising news – she had once owned the Bloomhouse too. Although its story spans decades, the Bloomhouse’s mission has always remained the same: to unite people in a celebration of the unusual, to encourage a rare kinship with a physical space and to shed the conventions of everyday life, if only for a little while.